Home > My 2015 Year End Market Report is out! 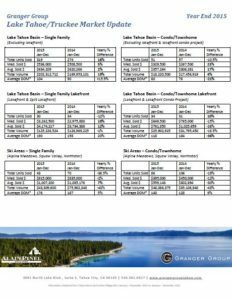 Sometimes it’s Truckee, sometimes lakefronts or the ski areas, but 2015 proved to be the year for the Tahoe Basin non-luxury market to shine. Single Family Residence (SFR) and Condo sales showed solid increases, particularly # of units sold for SFR’s (+16%) and price increases for Condos (+17%). This is great news when the MLS as a whole is still posting average prices 14% lower than 2006, and ski area sales…well, just look at the numbers. The good news for ski areas is: we can only go up from here!! I am confident we’ll see a spike in all ski area sales as excitement is rekindled with this year’s snowfall.